Sometimes small details on your road bike make a big difference. The Wheelsmfg FIX-BOLT-1 replaces the black plastic crank arm fixing bolt for Shimano Dura Ace 9000 with a grey anodized 6061 aluminium version. 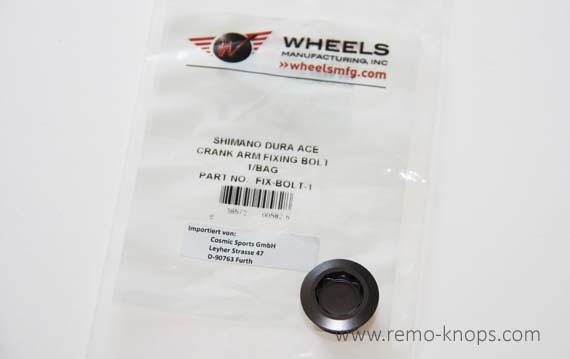 The Wheels Manufacturing crank fixing bolt is compatible with other Shimano HollowTech II crank-sets as well. In this article I will briefly look at the design and compare it with the original Shimano crank fixing bolt. I was look for an aluminium crank fixing bolt in silver or grey color with the original Shimano Hollowtech star so I could keep using my ParkTool BBT-10.2 Adjusting Cap Tool. I experienced the tolerances and build quality of aluminium cups, when I installed the C-Bear ceramic bottom bracket on my road bike. Both the KCNC crank fixing bolt and the Reset Racing crank fixing bolt have an open design which leaves the inner thread of the Dura Ace 9000 axle exposed to dirt and water. The NC17 crank fixing bolt has a closed design, but makes use of a big 8 mm. inbus making the ParkTool BBT-10.2 obsolete. Furthermore I don’t like a lot of branding on my bike, and only the Wheelsmfg FIX-BOLT-1 doesn’t have any branding. So let’s look at some Wheelsmfg FIX-BOLT-1 measurements (compared to the original Shimano Dura Ace 9000 crank fixing bolt on the right). The original Shimano Dura Ace 9000 crank fixing bolt has a longer thread length of 15 mm. I certainly would have liked the thread length to be a little longer on the Wheelsmfg FIX-BOLT-1, but the 8.5 mm is good enough to securely lock the Dura Ace 9000 crank arm in place. It pushes out the play of the crank-arm on the axle before you securely torque the two M6 bolts to 12-14 Nm according to Shimano guidance. The Wheelsmfg FIX-BOLT-1 is a light and secure replacement for the black plastic crank arm fixing bolt for Shimano Dura Ace 9000. As you can see in the picture above it looks really clean and tidy, although I would have preferred a little more silver finish. Wheels Manufacturing is a US-based company that connected me with local Dutch distributor Cosmic Sports and webshop Singlespeed. Both were very customer friendly and took care of fast delivery. For the high quality and excellent tolerances the price for the Wheelsmfg FIX-BOLT-1 is worth to pay. 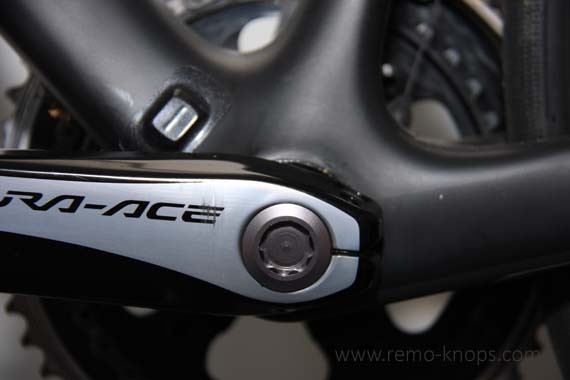 Hey!, I found this information for you: "Wheelsmfg FIX-BOLT-1 for Shimano Dura Ace 9000". Here is the website link: https://www.remo-knops.com/5467/wheelsmfg-fix-bolt-1-shimano-dura-ace-9000/. Thank you.